On Christmas Eve 1824, at the federal land sale in Crawfordsville, at 22, William Digby bought 84.23 acres along the Wabas that he would call Lafayette for $231.24. This was a fair sum and rumors have been long held it was from gambling winnings. Born in 1802, to the parents of meager means, this was the frontier and the rivers were the roads. Digby grew up working the rivers as a trader and could easily been a character in one of Twain’s tales. The river trade was not a place for choir boys. Gambling, fighting, and drinking were the basics, and he excelled at all..but Digby also had vision, was well liked, and considered to be fair, honest, and a good man. Lafayette grew and Digby grew old. He passed many days gambling on cards. One of his favorite opponents was Judge Pettit. During one particular binge, Digby bet and lost his house. The next day, the Judge hired a team to move it to his own lot, further up Main Street. They lifted it on wheels and began the move. By days end, Digby had won it back and ordered it returned. The next several days saw the scene repeated back and forth, until the house was left on the public square on a Sunday. By Monday, Digby was wiped out and it was delivered to the Judge’s lot, where it was his law office for many years. 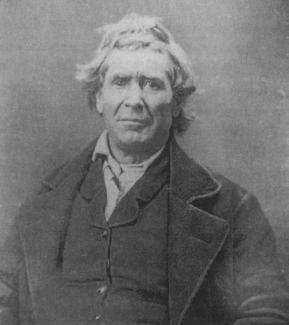 Digby died in 1864, and can be found in the Greenbush Cemetery with his card playing friends and other early residents. We think Digby would be proud of Lafayette, a thriving community with a strong economy and resources, culture and talent equal to cities twice our size. But there is an edge, tht harkens to our past and reflects the shadows of our history. Here’s to you “Old Dig.” We thank you! !…You did well!! Cheers! !